Have decided not to go down the USD fork route now due to costs. I came across this bike over the weekend and I think it is the way to go. Thinking of putting an F series front end on the bike and MAYBE changing the backend to the F series also. Will see what mods are needed to the Kawasaki swingarm to take the Honda Comstar wheels first. Anyone any experience fitting F series front/backend to a K series, your thought and opinions are welcome. Just a thought, but there is nothing particularly special about that bike in the video, and your bike is unique and appears to have been thoughtfully modified. I would be tempted to rebuild the motor, take care of any consumables such as chain, cables and tires and ride the thing. 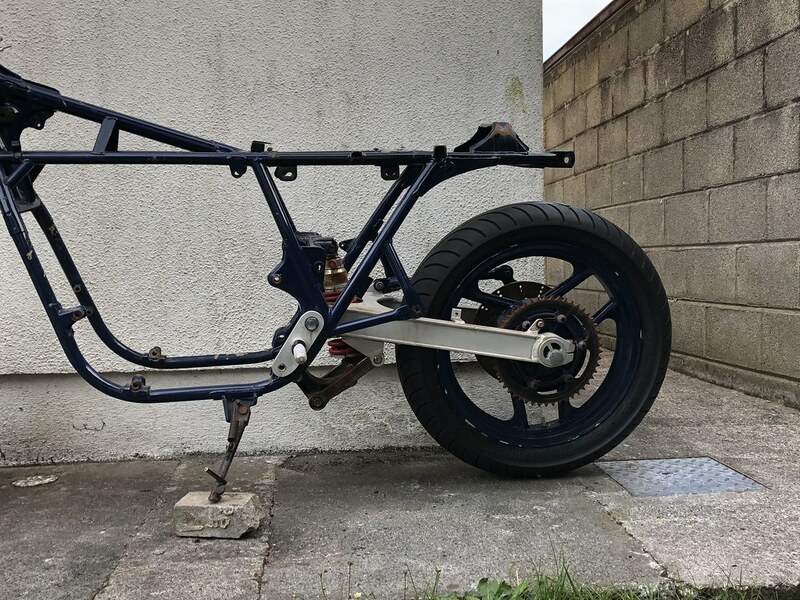 An F tank and suitable seat might look nice but I's avoid changing anything substantial until you have chance to ride it and see how it works. If you would prefer to have a bike more like the sample, maybe it would be better and cheaper to sell what you have and buy something that will take way less work to get it to look like that. I agree. The frame, swing arm scenario looks great. Nothing to gain from F components except a rear disc, which you already have. You also have a sought after swing arm because it allows you to adjust the geometry by rotating the axle mount and essentially raising or lowering the axle location. It's also a lot lighter than an F swing arm. I personally love those mags, but you can easily swap to Kawasaki KZ mags to give you more of a Lester-like look. Thanks for your comments. Definitely food for thought. 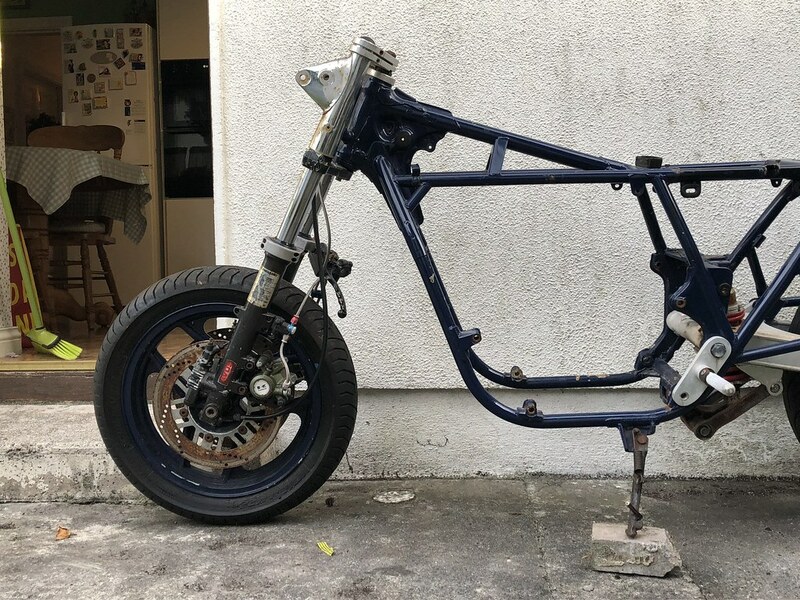 Perhaps a rolling chassis to fit my current motor would be a better option to get a big like this example and then overtime build out the current bike with all the mods. The bracket for the mono shock can stay on the frame so can always swap between the 2 once I get wheels I like for the current swingarm. There is just something about the look of the bike in the video I like. I personally love those mags, but you can easily swap to Kawasaki KZ mags to give you more of a Lester-like look. So you reckon KZ mags like this would spap in handy enough? The current front-end has a 16 inch front wheel so would need to make a 19 inch fit. Most likely change the whole front-end? I agree with Irk and Teazer on the chassis swap. 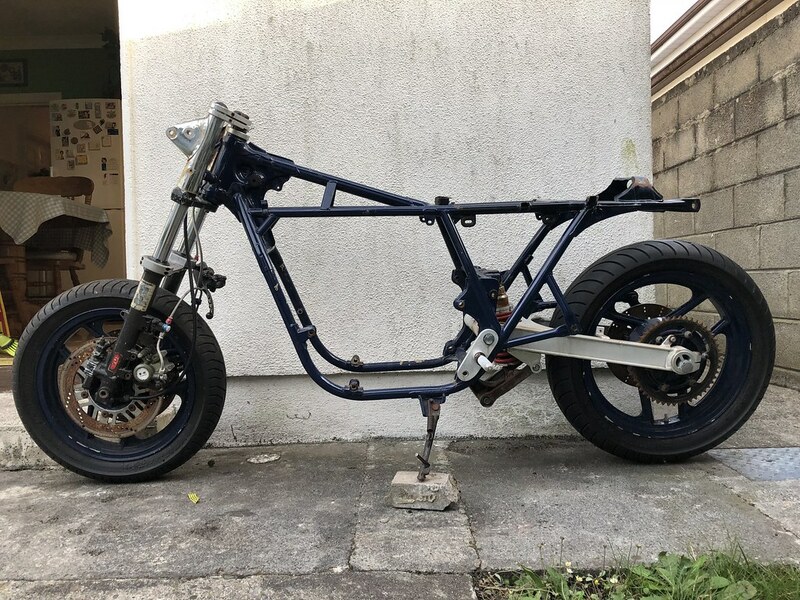 It would be far easier and less expensive to find a good stock CB750 chassis if you really want a bike like the one in the video you posted. The front end could be as easy as find a KZ front end with the same diameter forks as the CB and bolt it into the stock CB triple clamps. The rear will be a little different but there are plenty of KZ rears with disc setup. Look for late 70's, early 80's KZ1000 rear with a disc. I came across this today when searching and now has me thinking the Kwacker front and rear could actually work really well if I can get the lines right. IMHO. It's a good looking bike but it needs honest street tires. That bike is only "posing" as a tracker. Dirt tires and cafe clipons just do not go together. "cafe/tracker" isn't a thing. my .02. Yes I agree on the tires. It does give me food for though now on the monoshock. Took off the remaining items from the bike last night. Looks much better now without the handlebar risers, clocks etc. First up, different Kawasaki wheels.